Soccer Up!, known as Football Up! in Europe, is a funny soccer game that allows you a total control of any action of your team players: Control the ball, dribble and shoot with effect to confuse the goalkeeper and score a goal! The ball has inertia and will move freely over the field. Show your ability to control it and make short and long passes. Choose the height, effect and power before shooting to the goal. 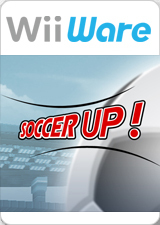 Become a soccer master and make your rival defenders tremble! Each country has its national team. You can create your own team with the in-game editor: give it the name you like, choose its equipment and the most important, play with your Mii saved on the Mii Channel of your Wii. The graph below charts the compatibility with Soccer Up! since Dolphin's 2.0 release, listing revisions only where a compatibility change occurred. This page was last edited on 15 January 2018, at 04:41.